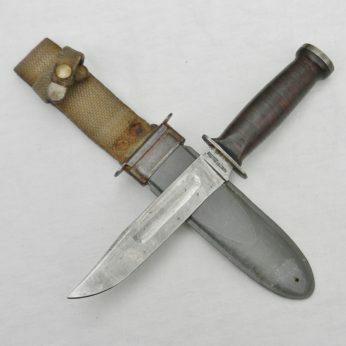 KA-BAR Polished Commando WW2 American fighting knife with original GI-decorated leather scabbard signed Cpl FRANK C KOZIOL – a nice touch! 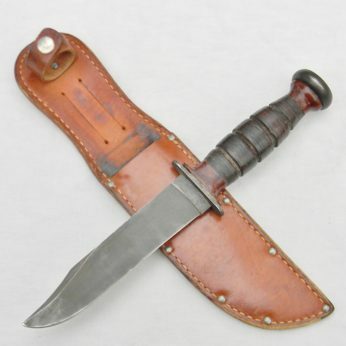 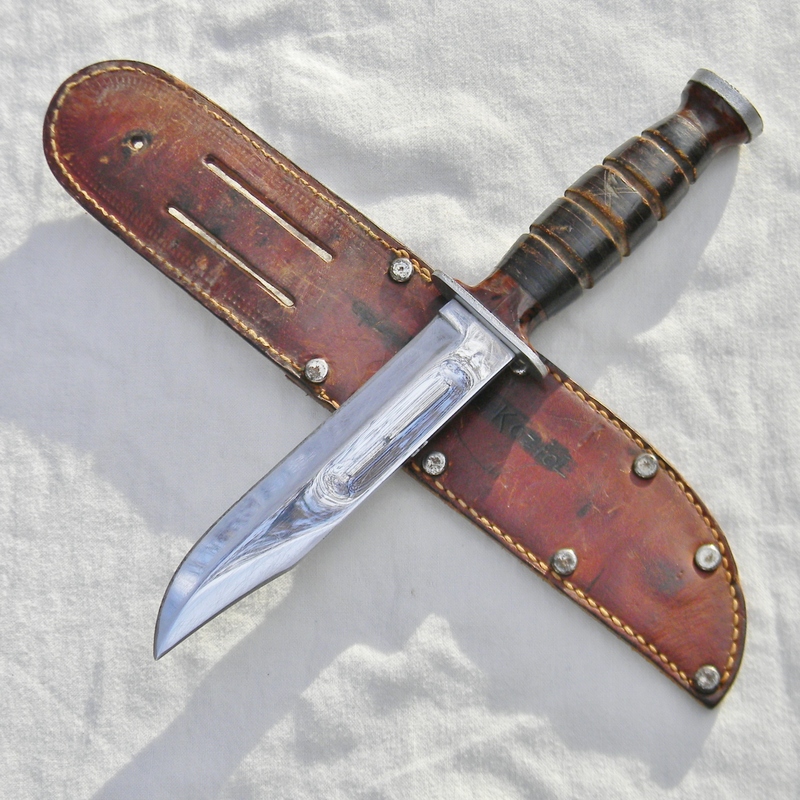 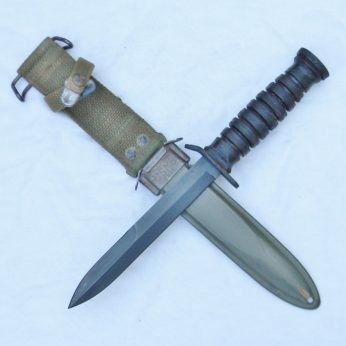 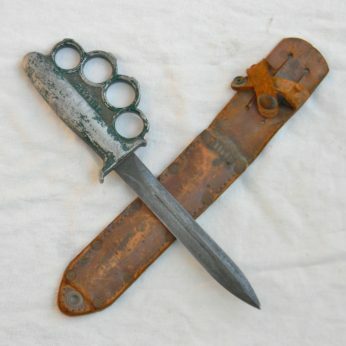 Original WW-2 era American fighting knife made by the famous KA-BAR company known as the “KA-BAR Polished Commando”. Privately manufactured during the war, these handy knives were sold to the American servicemen in need of an all-purpose fighting/survival knife. 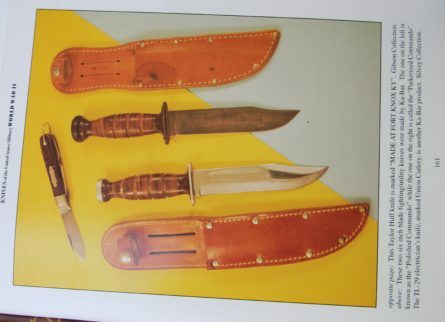 This exact type is illustrated on page 161 of the KNIVES OF THE UNITED STATES MILITARY WORLD WAR II book by Michael W. Silvey – a well-established expert an author of many books on the subject of US military edged weapons (see the book’s page photo attached). 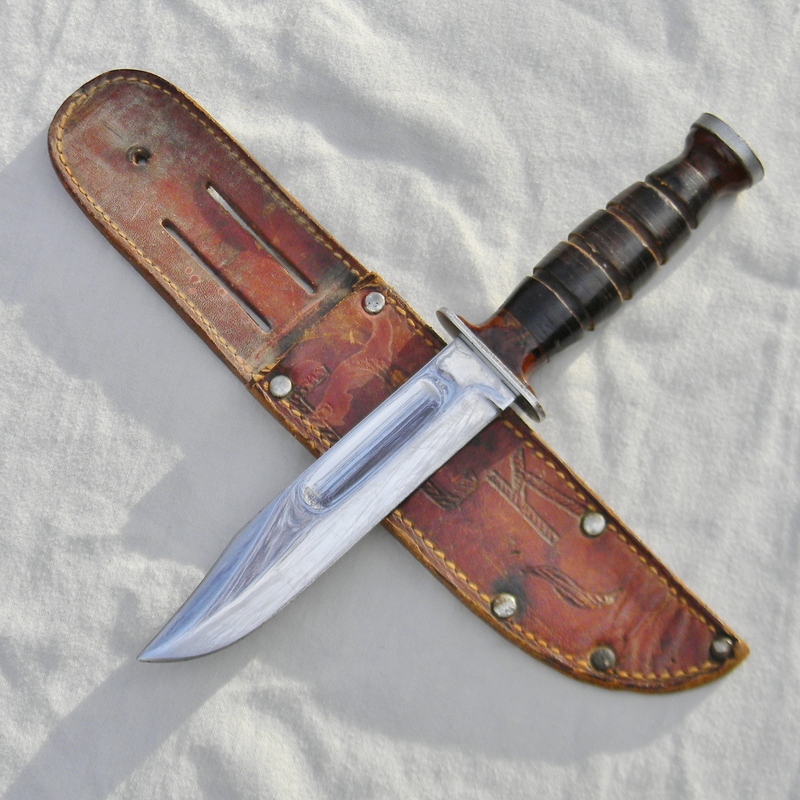 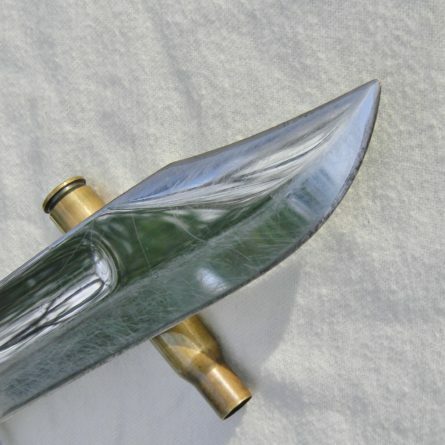 This is the Polished Commando type fighting knife with chrome-plated blade for a superior rust protection. 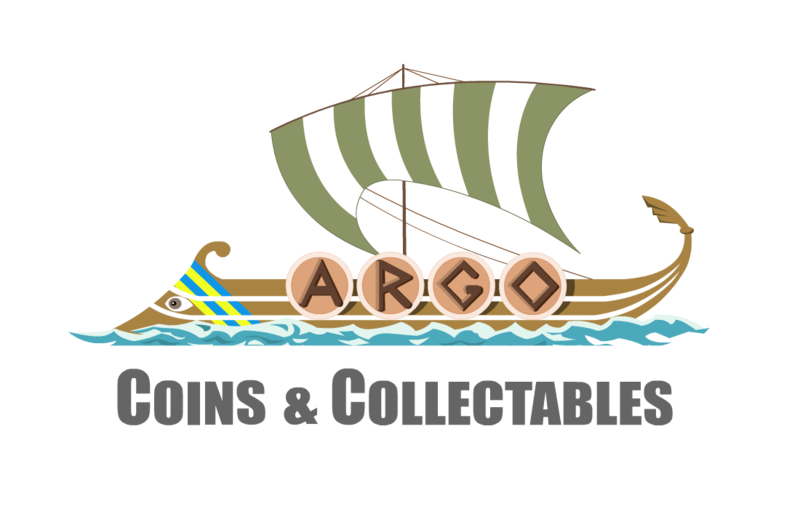 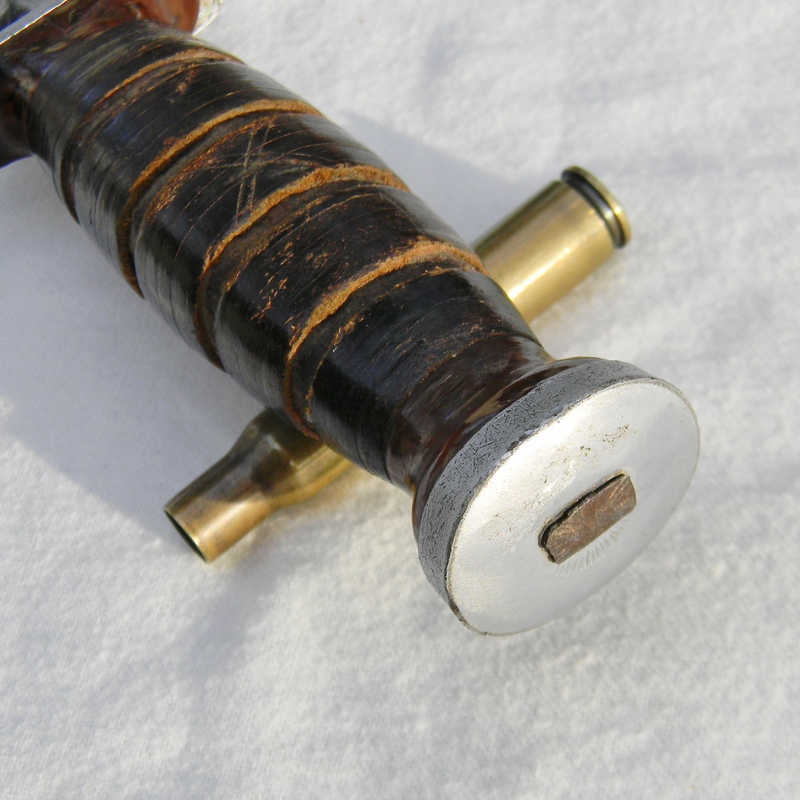 The distinctive brown Bakelite spacers at the ends of the handle are in excellent overall condition with no cracks; stacked leather washers handle with thick oval iron pommel; all parts are tight. 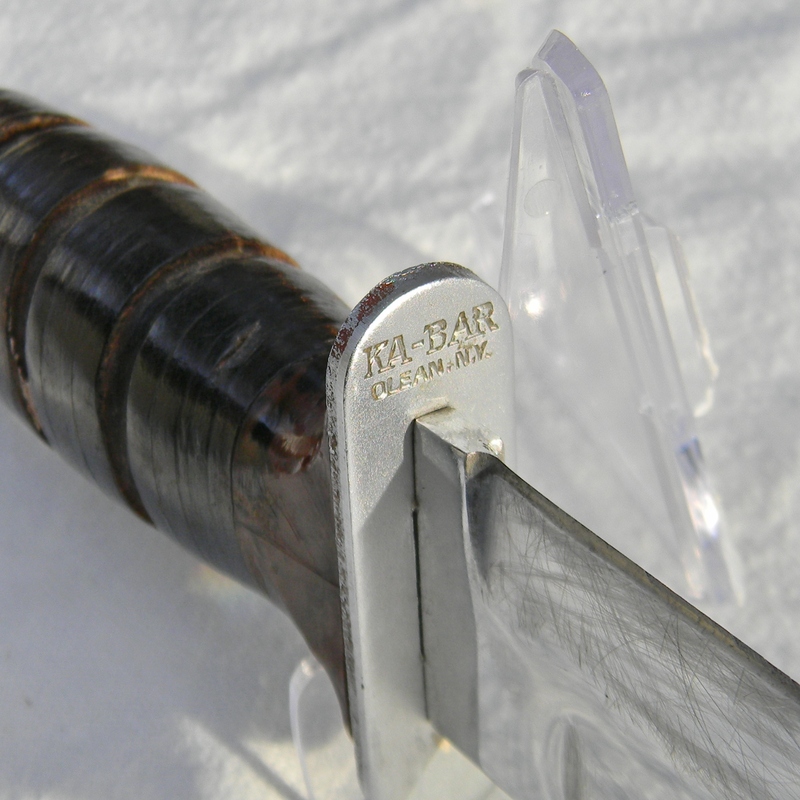 The guard’s top side is stamped KA-BAR / OLEAN, N.Y. 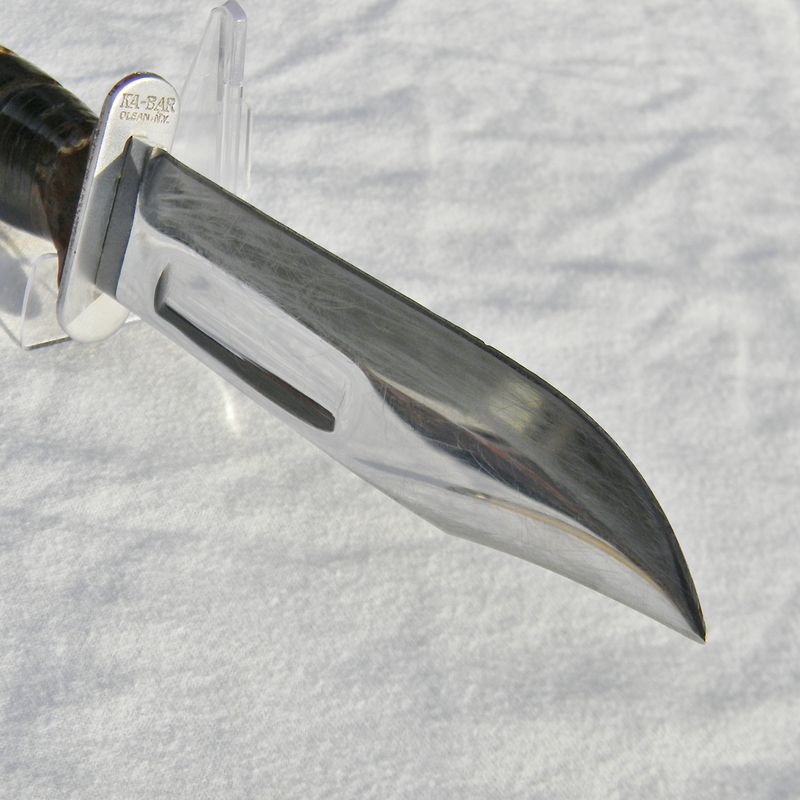 The knife is about 10-1/2″ / 26.7 cm overall; the blade is about 5-7/8″ /15 cm; the edge has been re-sharpened; the tip is intact. 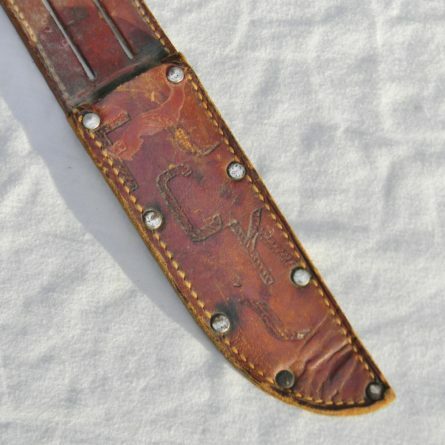 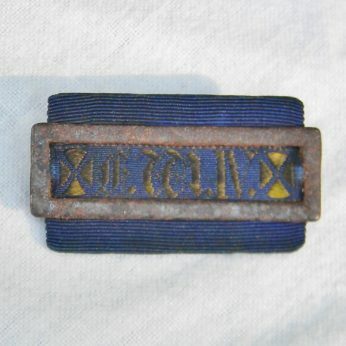 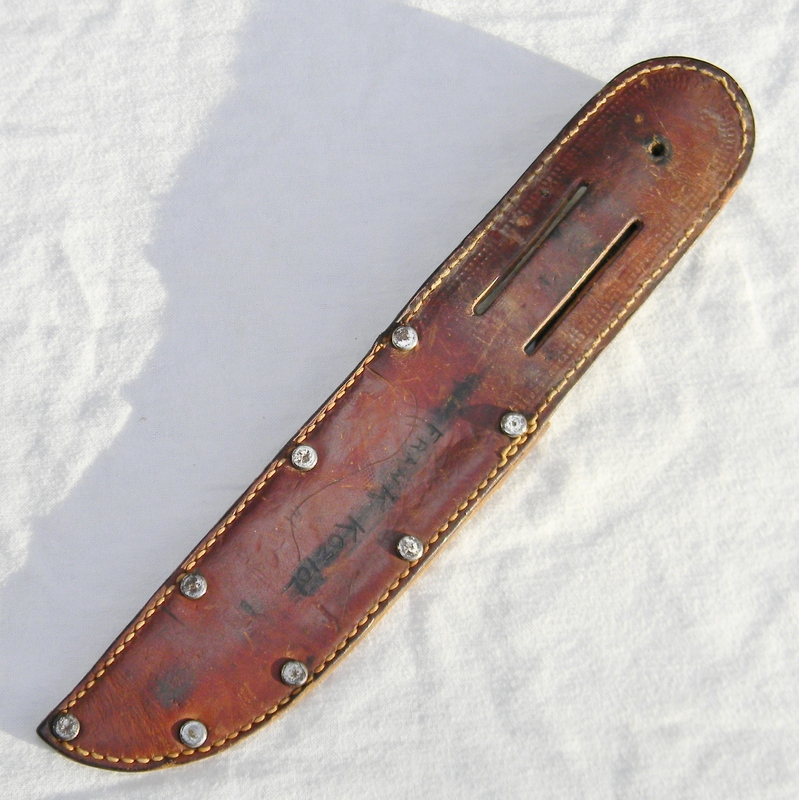 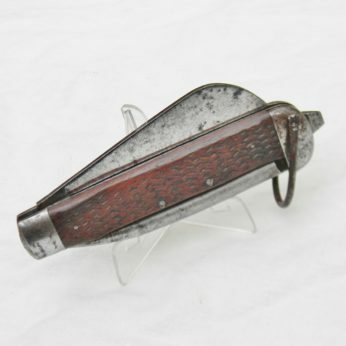 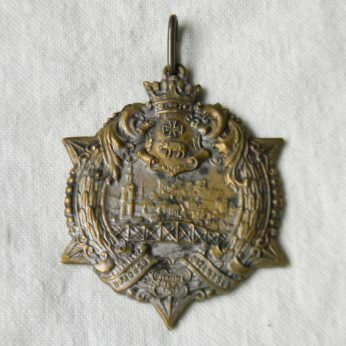 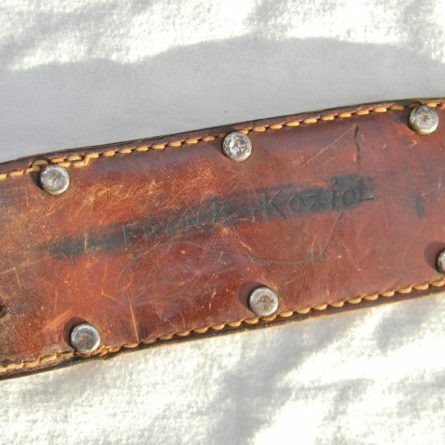 Original lather scabbard is decorated on the front with large letters F C K and signed on the back Cpl Frank Koziol – looks like the original owner was of Polish ancestry. 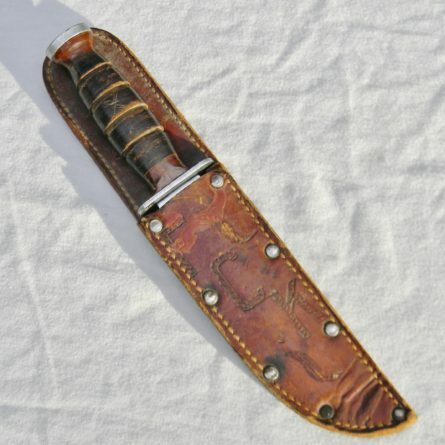 The scabbard is in great overall condition, considering the age; the leather is soft and supple. The keeper is missing, but all stitching and original rivets are intact – it is in 100% serviceable condition still. 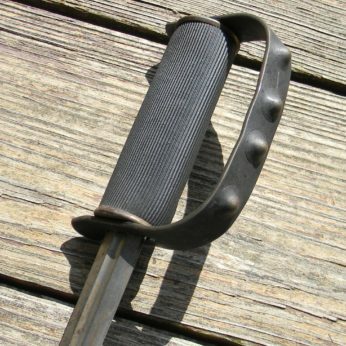 Most of these KA-BAR Commandos were used in the field as intended; this type is VERY hard to find in better grades – brittle bakelite handle spacers were prone to cracking under stress. 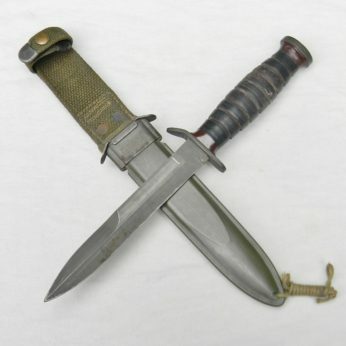 Overall, this KA-BAR Polished Commando WW2 American fighting knife with original GI-signed leather scabbard is in 100% serviceable condition still – don’t miss your chance to add it to your collection! 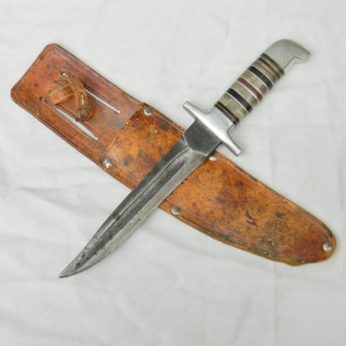 This attractive fighting knife has not been cleaned or tampered with in any way, 100% original condition; these are the actual photos. 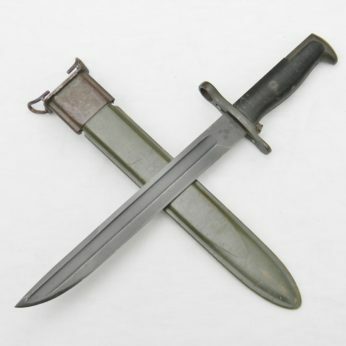 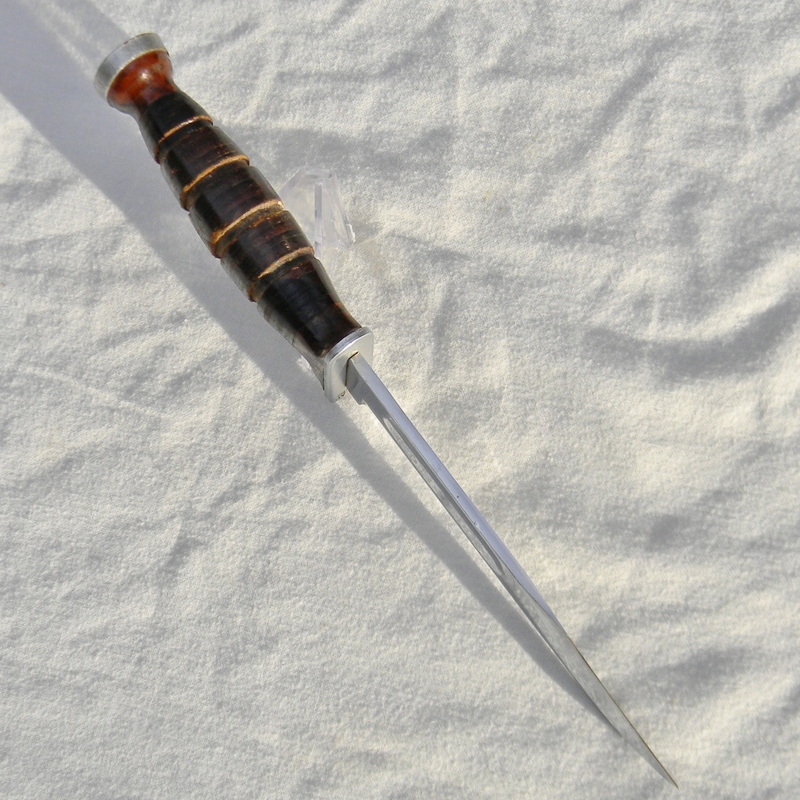 We have several scarce WW1 and WW2 fighting daggers and trench knives available for sale – please take a look in our Militaria section.